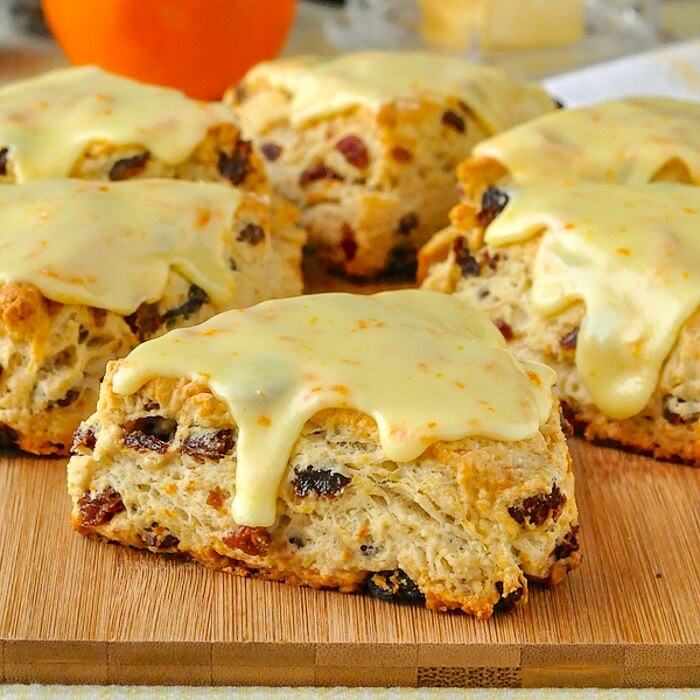 Orange Raisin Scones with Orange Glaze. 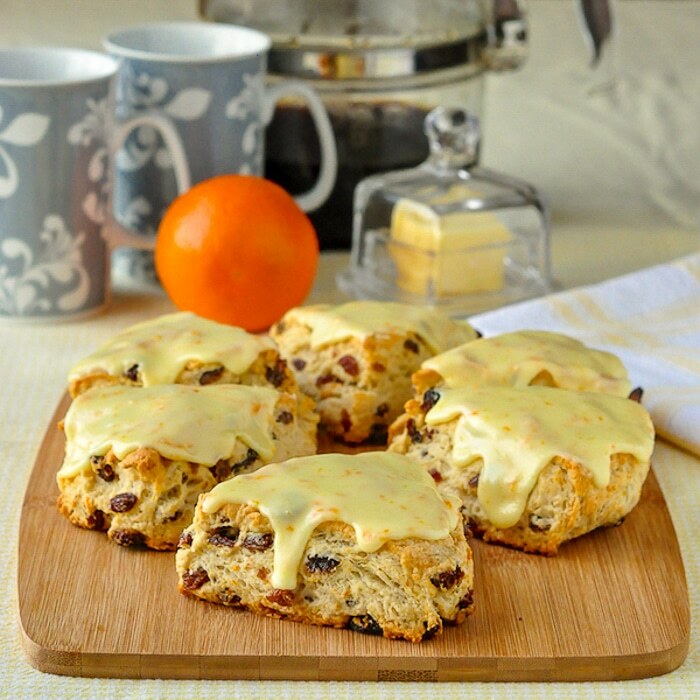 Tender English style scones infused with orange flavour and packed with raisins before being topped with a sweet but tangy orange glaze. 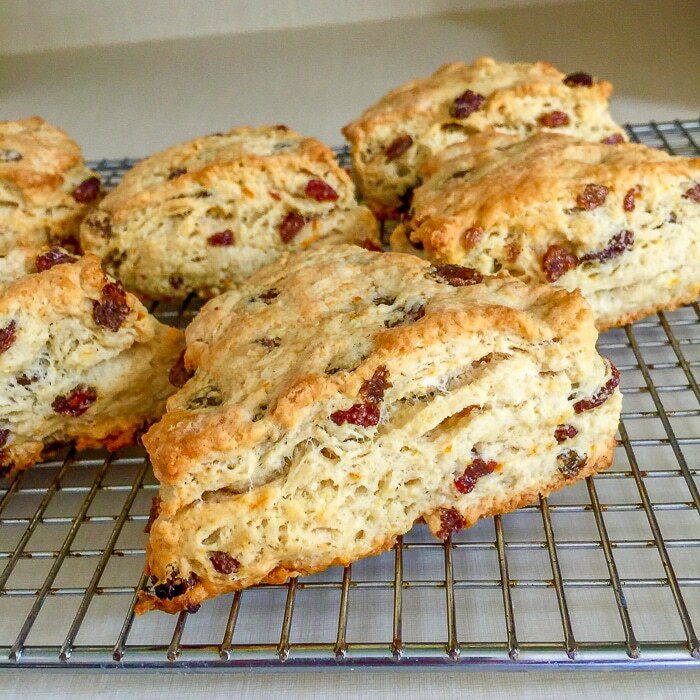 This version of raisin scones really does remind me of growing up here in Newfoundland. Raisin tea buns were a specialty of many bakers in my extended family but raisin wasn’t the only popular version. My mother made orange tea buns and coconut tea buns as well, and they can still be often found in her freezer to this day. Recently I saw a cherry scone on Pinterest that had a vanilla glaze on it and I remember thinking they looked particularly tempting. I had never glazed tea buns or scones before. For occasions like birthday brunches or holiday breakfasts, they would make extra special additions to the table. I set out to fancify plain old raisin scones. My inspiration came from the last 2 bright orange tangelos in the fridge, which since childhood have been a favourite citrus fruit. I used all of the zest of one of them in the scone dough and in the glaze as well to pack plenty of orange flavour into these delicious scones. Once finished and photos taken, I gobbled one straight down; they were amazing! Spouse resisted. She even refused a bite of mine, but after a few minutes was tempted to break off a corner of one to try it. …and then another, and then a small piece from the centre and then…well, I think we all know how this story ends. 5 minutes later not a crumb of the scone could be found. They really are very irresistible. Orange Raisin Scones fresh from the oven. If raisins are not your thing, these scones pack enough orange flavour to stand up all on their own. I’ll admit that I packed quite a number of raisins into this batch because I love them but they could easily do with half the amount if you prefer less. Give these a try for early morning weekend baking; they’d make a great start to anyone’s day. 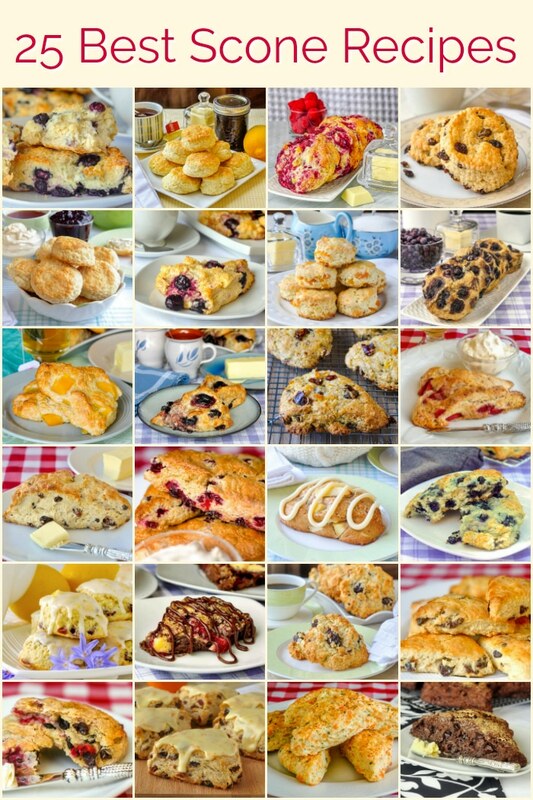 Looking for other scone recipe ideas for brunch? We have an entire category of Scones, Biscuits and Muffins for you to browse. 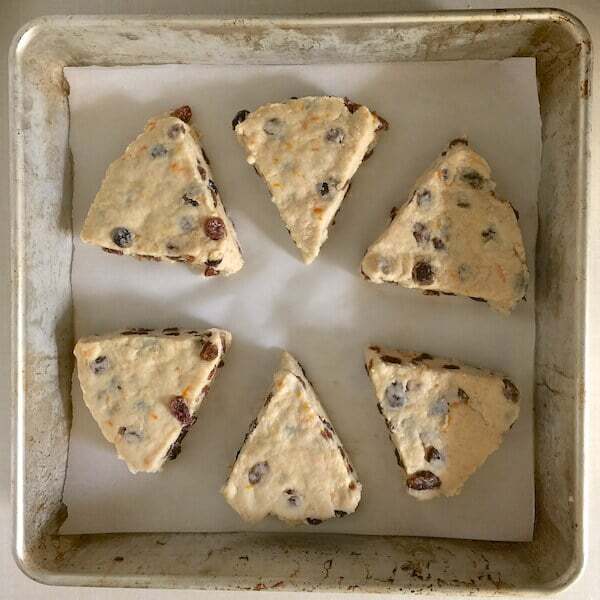 Like this Orange Raisin Scones recipe? 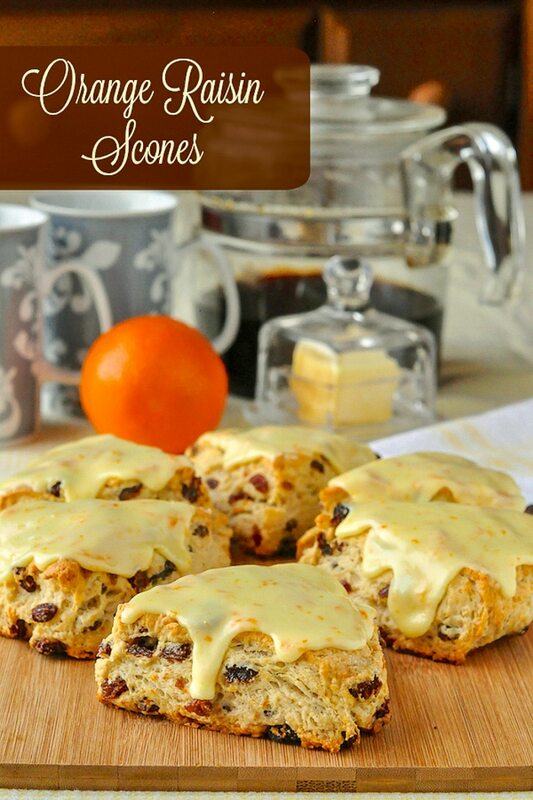 Orange Raisin Scones with Orange Glaze - tender English style scones infused with orange flavour and packed with raisins before being topped with a sweet but tangy orange glaze. Servings: 18 one and a half inch scones or 6 - 8 large trianglar scones. Add the liquid to the dry ingredients along with the raisins and stir in quickly with a wooden spoon until a soft dough forms. It should be a little sticky. Don’t over work the dough or your scones will get tough and not rise well. Pop the scones into the hot oven for about 12-15 minutes (15-20 minutes for large scones) or until the tops of the scones are evenly browned. Cool on a wire rack. Top with orange glaze. Simply whisk the ingredients together until smooth. You want a thick glaze that can be spread on with a knife or small spatula. Add a little more icing sugar if the glaze is too thin. Spread on the scones and leave the glaze to set for about 20 minutes before serving. Thank you Barry. I love raisins too. Have a good weekend! I can’t wait to make this recipe. I love getting recipes from this site. Thank you. These scones are gorgeous!! I love the flavor combination here!